What is a procurement nurse? We are a relatively new breed of nursing expert who bring clinical expertise to procurement. In principle, the aim is to deliver safer practice and economic benefits through intelligent procurement. How can procurement improve safety and also deliver savings? I’ll give you an example. If I was looking at IV wound dressings, I would assess all the products in the marketplace to determine which ones work and which are less successful. This would include reviewing independent evidence. After selecting one of the right quality and negotiating a good price for the volume the hospital needed, I would initiate the change with nursing staff and manage any training and support needs. A specialist nurse brings credibility and common sense to this process. We can spot less effective products and persuade colleagues of the benefits of change. It is a cliché, but there really is no such thing. Today started with a meeting to discuss safety devices for cannulas. Then I was in paediatric intensive care, considering how we can improve patients’ mouth care, before going to adult intensive care to do the same. Next I went to the emergency department to see how to improve patient flows by getting the right stock in the right place, so everything is to hand and as little time as possible is wasted. Aside from common sense, what do nurses bring to procurement? While my finance and procurement colleagues talk about project management, I follow the nursing process: assess, plan, implement and evaluate. I use the same skills as any nurse – I just use them a bit differently. I also bring compassion to the role. I often need to ask clinical colleagues to change what they do – and that’s never easy. When undertaking a procedure, for example, inserting a urinary catheter, 70-80% of patients will require a standardised procedure and methodology. With that comes best practice. There will always be patients who require something different to make it work for them. You have to determine which bits you can standardise and which you can’t. The role requires a clinician who has credibility with the procurement and finance specialists and who can explain why we will never get 100% compliance with a standardisation and rationalisation programme. I fell into it 11 years ago when looking for a job that would fit with my caring commitments. Like many nurses, my first reaction was ‘what on earth is procurement?’, but I have never looked back. I now have a team of four procurement nurses working alongside me. 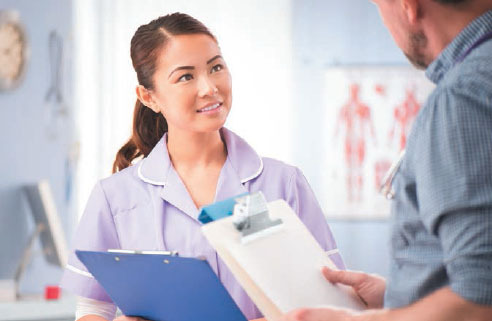 What do you look for in candidates for nurse procurement roles? Someone with passion and compassion who can inspire disparate ward, clinic and theatre teams. I need someone who can deflect criticism and spot a corporate sell for what it is. Most of all, someone who understands that if we get the right products at the right price, in the right place at the right time, patient care and outcomes improve.